I thought it was about time to have a giveaway, and when I checked my list of posts, I realised that it was my 6-month blogiversary a couple of weeks ago, so what better reason? Writing this blog has been a lot more enjoyable than I'd expected. Not many of my "real-life" friends are crafty, so I really enjoy the contact I've made with a community of super-talented, inspiring people. I read and appreciate each of your comments, even though I don't always have time to respond to you individually. So to say thank you, I'd like to host my first giveaway. This sweet little cat has been keeping me company on my sewing table for a couple of weeks, but it's now time for her to go to another home. She is made from new and thrifted cotton, denim and acrylic felt. Her face is embroidered and she is filled with polyfill. She is willing to travel anywhere in the world to her new home. If you would like to go in the draw, please leave a comment below. I will draw a random number next Monday, May 28th. It's lovely Louise. I'd like to go into the draw please! Congratulations on 6 months of blogging! This is my first visit to your blog - love your summary of bag tutorials, and your little cat is adorable! It's lovely! Giveaway blogs are guaranteed to bring a surge of comenters out of the woodwork! Happy blogiversary! 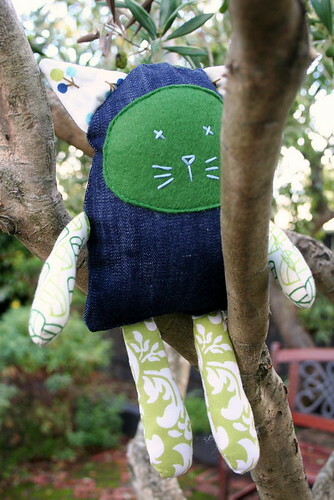 Gorgeous cat - I love the fabrics you have used. Congrats on the 6th month blogiversary! I enjoy reading your blog...if I should win this little cutie would be added to the softie collection I have been making for my niece to play with when she comes to visit me! If I don't win your one I am going to make one just like it! Thanks for writing such a cool blog- I always love seeing what you're making. Congratulations on the blog-a-versary. The cat is lovely. Oh yes please! Always up for a draw! Hello. Its nice to read your blog. The fantail stencil is fab. If i won this little sweetie i'd gift it to a friend of mine who's about to have a baby.